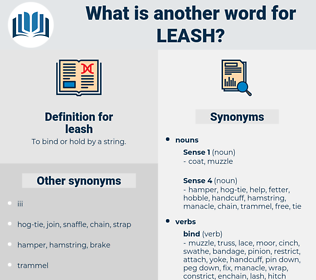 What is another word for leash? 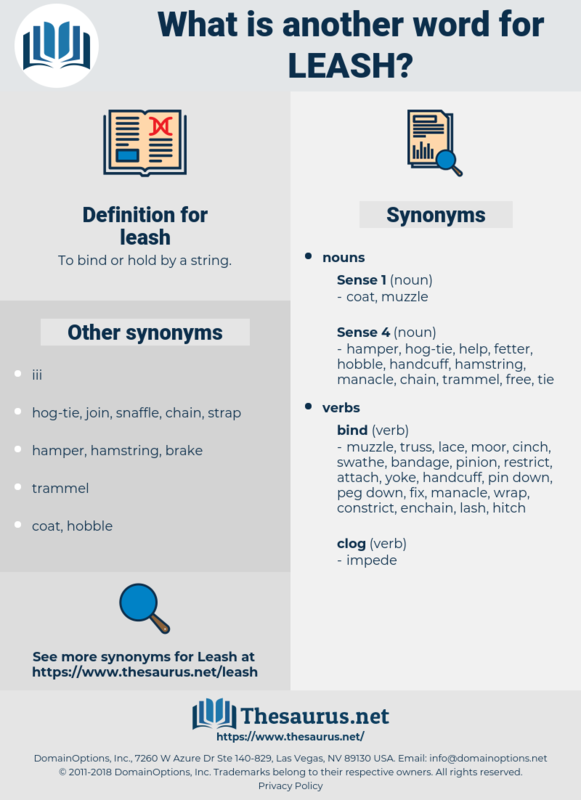 To bind or hold by a string. But O soul attend, Yield not to impotence, shake off your fears, Be steadfast, balanced, free from hate and anger, Balanced in pleasure and pain, and active, Yet disregarding action's fruits - be friendly, Compassionate, forgiving, self - controlled, Resolute, not shrinking from the world, But mixing in its toils as fate may say; Pure, expert, passionless, desire in leash, Renouncing good and evil, to friend and foe, In fame and ignominy destitute Of that attachment which disturbs the vision And labor of the soul. Even intellectual as you are, you can't tell what it is to feel power within, to strain at the leash, and see others in the race. lees, lassa, liliaceous, leo xiii, lucy, lazy, lascaux, lash, loasaceae, loach, lachaise, loki, lxiii, loss, liaise, loggia, lose, lucas, lichee, Louis Ix, lichi, lax, leg, lac, log, leechee, lilylike, lexis, leech, lockage, lilac, lock, luck, lxxxii, Louis Xiii, lao-zi, louche, luggage, lollygag, locus, Lugh, loligo, leo ix, loess, luik, lx, lass, liliales, lewisia, Louis Ii, look away, lycosa, lease, lake, leak, louis, lessee, laos, log z's, loxia, luxe, lace, lac wax, lxii, Louis Agassiz, laugh away, lousy, Liliaceae, logy, lag, liesch, lachesis, Leo Esaki, lallygag, lhasa, lack, Lusaka, laws, Louis I, lxxx, loose, lacy, luce, lock away, legacy, lakh, luscious, like, lisu, loos, leakage, llullaillaco, lagos, lxxiii, lxxi, leaky, loasa, luke, leggy, lake keuka, lazio, luge, lough, league, lygus, lxxii, Louis Xii, lasso, lackey, leigh, leakey, lek, loquacious, leach, less, laicise, Lego, Leo X, lycee, lyssa, laze, lush, lie awake, lossy, loco, lysis, lxx, losses, lasix, loge, Lake Cayuga, lugosi, laugh, leek, laic, lxxxiii, locke, laius, Louis XI, laicize, logos, lick, lychee, logic, lux, legs, look, loloish, logo, low-key, Louis X, lox, leuciscus, lassie, Lech, lechwe, Louis Iii, lug, louse, leacock, lxi, lxxxi, liege, likewise, liza, lycia, lucky, loch, lawless, lochia, lewis, lockjaw.